Judge Joel M. Goldberg (ret. 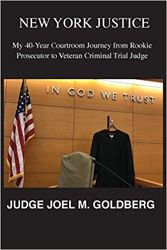 ), formerly a trial judge in the New York Supreme Court in Brooklyn and Staten Island and author of "New York Justice, My 40-Year Courtroom Journey from Rookie Prosecutor to Veteran Criminal Trial Judge," will be the featured speaker at the November 15, 2017 luncheon meeting of the Staten Island Real Estate Developer Roundtable at the Hilton Garden Inn. Judge Goldberg's address to the real estate group is titled, "The Three Most Important Things in a Murder Trial: Location, Location, Location" and will discuss the memorable circumstances involving locating the perpetrator, locating the witnesses, and locating the physical evidence in some of his front page Staten Island and Brooklyn murder trials.